Ryan Casselman hopes his final junior hockey season will end in a championship. Photo by Adam Prudhomme. Ryan Casselman is hoping his final year of junior eligibility is a memorable one. The 20-year-old Napanee native will spend his last season with his hometown Raiders, looking first and foremost to improve upon the team’s disappointing first round exit in last year’s playoffs. If he tops his league leading 48 goals and 69 assists in the process, so much the better. Casselman has experienced highs and lows in his junior career. In 2017 he scored the game-winning goal to lead the Junior A Cobourg Cougars to the RBC Cup. The following year he returned to Junior C where he led the Raiders to their best finish in franchise history with a 37-2-1 record. He was also named the league’s MVP and earned the OHA’s Donald Sanderson Award, complete with a presentation at Toronto’s historic Hockey Hall of Fame. Yet the season still ended on a sour note as a team that was expected to challenge for the Schmalz Cup was eliminated by the fourth place Amherstview Jets in the Tod Division’s first round. 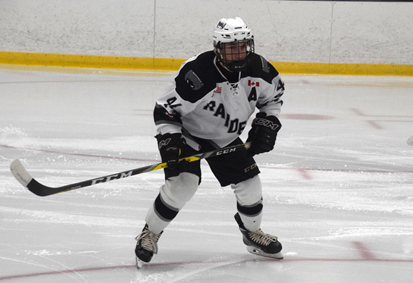 Though the Raiders did lose three of their top five scorers from last year, with only Casselman (117) and Austin Labelle (76) returning from that group, the team should have no issue replacing those numbers with the acquisition of Evan Foley, Cameron Harris and Dayton Kent from Port Hope. That should prevent teams from double-teaming Casselman.